Earlier this week we noted that as trader attentions have been focused on more conventional indicators of market risk, the USD Libor-OIS spread - historical a sign of credit concerns - has been blowing up, widening the most since last Feb as Libor has continued to creep higher, while commercial paper rates for financials are also rising as more issuers have been selling longer-dated obligations, and moving closer on the curve. Well, earlier today the USD Libor-OIS spread widened again, pushing to 35bp, from 34bp the prior session as three-month Libor rose for the 13th straight session. Among the most immediate catalysts for the rise is that as Bloomberg noted this morning, BofA revised its 3M Libor forecasts higher, and now sees 2.6% at end-2018 assuming three Fed rate hikes in 2018, a higher Fed effective rate and “persistent tightness” in USD funding conditions. The bank also boosted its Libor-OIS spread forecasts based on said tightening in USD funding conditions "and its evolution over coming quarters" and now sees 31bp by end-1Q, 38bp by year-end. The key question here, and one we asked on Wednesday, is "why is there persistent tightness" in USD funding conditions, and is there another dollar shortage quietly forming behind the scenes? In short, and as explained in more detail previously, the answer may be yes, and the culprit is the same "echo taper" discussed here last year (and recently by Credit Suisse's Zoltan Pozsar) , when we commented on the impact repatriation would have on rates, and especially the front-end. To grossly simplify, what is going on is what as a result of the hundreds of billion in repatriated cash, many companies will use the newly unencumbered proceeds to repurchase debt and delever (if only on a gross basis). This has a direct impact on dollar funding markets, and specifically the Libor OIS, as financial markets are now losing one of the biggest providers of funding in the front-end. This is certainly the case in the corporate bond market, but also the commercial paper market, money market funds, CDs, securitized products and other fixed income asset classes. This was explained last October in "Why US Tax Reform Will Put Even More Pressure On Dollar Funding Markets." As BofA's Hans Mikkelsen wrote, "it is impossible to overestimate the importance of this story and we are seeing the effects already in a number of ways." First, we think liquidations the past two weeks of 1-3 year paper in the corporate bond market is to some extent driven by this story (liquidations from foreign investors are possible too and the cost of dollar hedging is too high). 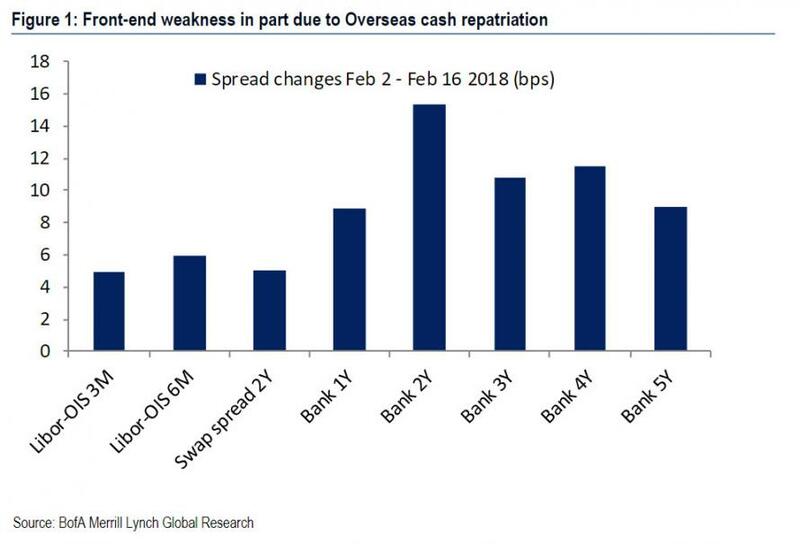 With every passing day, and with ever 1bps increase in the Libor-OIS spread, we are seeing the indirect effect repatriation will have on this key part of the fixed income market. And now, in an alarming twist, it's no longer just the US that is impacted. As Bloomberg's Richard Jones writes, "the rising USD Libor and wider FRA/OIS spreads are starting to infect other markets." Jones says to look at the U.K., where the ~5bps increase in 3-mo. GBP Libor fixings this month is drawing plenty of interest -- especially as over half of the move occurred this week. While part of that move is due to expectations of higher BOE rates, because the Libors are slower to price those in than Sonias or Short-Sterling contracts, with both the Fed and BOE having recently raised rates (and expected to do more), the higher USD fixing will exert upward pressure on the GBP fixing as well. More importantly, Jones writes that traditionally wider OIS spreads have been a sign of credit concerns, and adding to the complication, you are get a widening of the cross-currency basis with it, which in turn makes it less economical for foreigners to purchase US Treasurys. In this context, below we show why buying FX-hedged US debt has become non economical. The Nordea chart below shows that a European investor is better off buying BUNDS than UST FX Hedged. What is causing this distortion? According to Jones, given that the 3M cross-Fx basis is quite tight, it's clear other influences such as the supply of T-bills is in play; add to this concerns over how repatriation will impact dollar funding, and what until now was a modest tempest in a teacup has literally crossed across the ocean. 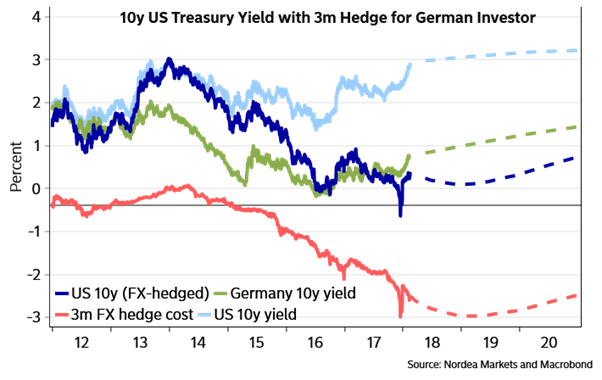 The irony is that the tighter the USD-funding conditions get, the wider the FRA/OIS spread will drift, the less global demand for FX-hedged US paper there will be, the higher US Treasury rates rise to prompt demand, until eventually yields push so high that the already stretched correlation between rising yields and stocks finally snaps, leading to an equity correction (or crash), which in turn forces the Fed to ease financial conditions, resetting the cycle all over again. 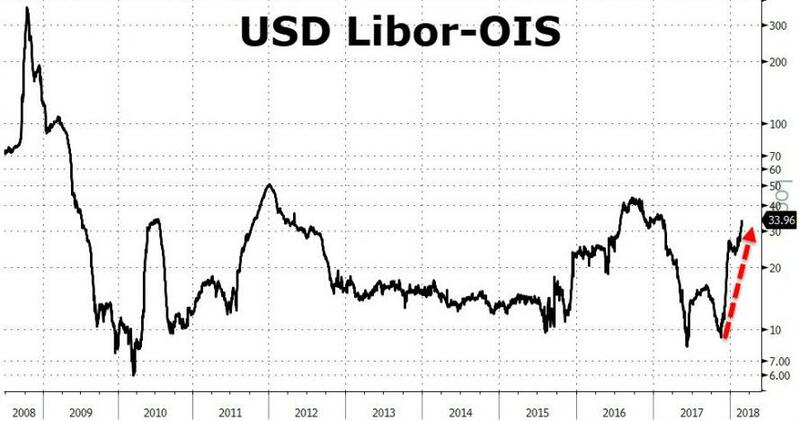 Bottom line: in addition to following the 10Y, the USD, and of course the S&P, add Libor/OIS to your watchlist: it may prove the most forward-looking canary in this particular coal mine.